The Power, The Performance, The Heritage Of Eventide Audio Effects In A Single Rack Space Unit. There’s never been a compact effects box like Eclipse. From the amazing range and depth of its algorithms to its comprehensive array of analog and digital I/O ports, the Eclipse puts the legendary effects processing power of Eventide within your reach. Eclipse is the only effects processor in its class to feature 24-bit digital conversion and 96kHz sampling. We’ve packed almost 100 algorithms into Eclipse along with a two effects block design. The dual routing configurations let you use Eclipse as two independent effects processors; ideal for the smaller, budget-conscious studio. 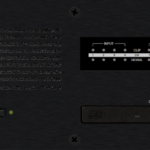 The two effects blocks’ inputs and outputs can be configured for stereo or mono. Or, select a preset that combines two algorithms or recursive combinations for big multi-effects without sacrificing quality. We’ve packed Eclipse with effects Eventide is famous for. There’s quick, seamless pitch shifting including our innovative Micro pitch shift, which FOH engineers and vocalists have come to rely on for turning good vocal performances into great ones. Eclipse boasts no fewer than 11 reverberation algorithms plus four plex algorithms. Originally developed for Eventide’s industry-standard Orville™ and DSP 7000 series, these reverbs have been carefully and faithfully transplanted into Eclipse. And all reverbs are true stereo in and out, not mono in, stereo out. The vast array of delays lets you design lush, dense soundscapes. You’ll find band delays, chorus delays, comb delays, ducked delays, ring delays and pan delays. And with 20 seconds of memory per effects block, Eclipse is a looper’s delight. It’s easy to get lost in the 20-second mono loop, 10-second dual loops, 20-second reverse loop, and 10-second dual reverse loop. Remember, these looping presets running on one FX block leaves the other FX block available for adding texture or dimension. Whether it’s live performance, front-of-house engineering, or quality studio processing, Eclipse gives you the tools you can depend on in one compact, professional package. After all, Eclipse is not just an effects box, it’s an Eventide. The rear panel has a port to support all your needs, including AES/EBU, S/PDIF and ADAT™ Lightpipe™ for digital applications. Analog balanced XLR-type and unbalanced ¼” inputs and outputs. The ¼” jacks even accept a high impedance instrument signal. There’s Word Clock In and Out on BNC connectors and two pedal ports for performers. And of course, full MIDI (IN/OUT/THRU) including an external power jack for your cabling convenience. There’s even a serial port which makes it easy to update Eclipse’s software from the internet; no chip changing needed. The Eventide knob and keypad make setup and operation easy. If you’re familiar with our H3000 series Harmonizer units, you’ve already got the basics. Hot Keys provide quick access to the eight most important parameters on every preset. In addition, you can customize the Hot Keys on any preset to create your own unique program. The tap button isn’t just for delays. It’s also the frequency rate of the LFO modulating your sample and hold filter, or the speed of your autopanner or tremolo. The Tap function can be set to average out from 2 to 12 taps. You get a complete selection of presets, but Eclipse makes it easy to design your own. Load one or two algorithms, pick a routing, assign the Hot Keys, and tweak. Your presets can be stored easily in the Eclipse or on an affordable compact flash card. Transferring presets from one Eclipse to another is simple with compact flash cards.